Vincent Bugliosi wants George W. Bush prosecuted for murder. There are others who are complicit in the crime, namely the Vice President and Condoleezza Rice, but Bush is the target of this famed former Los Angeles prosecutor (the Charles Manson case) and best selling author (Helter SkelterThe Betrayal of America as two examples). He is undeterred by the virtual major media blackout on interviews and advertising. He's taking his case directly to the people through alternate media and the internet. 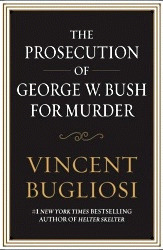 Bugliosi constructs a devastating case in The Prosecution of George W. Bush for Murde r. As I write this review, it is still difficult to grasp my sense of shock at this title with this author's name below it. A legendary prosecutor with a near perfect record in big cases, Bugliosi articulates one of the most revolutionary ideas imaginable in a mix of today's otherwise vapid and obtuse political thinking. But first, the book and how the prosecutor makes his case. The president "knowingly and deliberately" caused the deaths of U.S. soldiers and Iraqi civilians and that's called murder, plain and simple. This is not a hypothetical case that could happen under special legal interpretations. When the president leaves office, he is subject to the same law as the rest of us. Bugliosi explains the ability to prosecute the case against George W. Bush by a district attorney or states attorney in any local jurisdiction where a life was lost in the Iraq war. Federal prosecutors also have that option. Bugliosi's detailed analysis of this phenomenon offers some of the best analysis in the book and the detailed end notes. In the first chapter, "Opening up One's Eyes," Bugliosi explains how he was able to reach this conclusion and then encourages the reader to do the same. He attributes his huge success as a prosecutor and author to his willingness' to "see what's in front of me completely uninfluenced by the clothing (reputation, hoopla, conventional wisdom, etc.) put on it by others" (p. 5). After the stage is set for an open minded look at recent history, we're offered a series of incriminating quotations from Bush, Cheney, Rice, and others. Before the invasion, these statements had the power to shift public opinion in favor of the war. How could we tolerate a dictator, Bush asked, who "threaten(ed) the world with horrible poisons and diseases, and gasses and atomic weapons"? Iraq had "unmanned aerial vehicles" and was "exploring ways of using these to target the United States" (p. 22). These and other inflammatory claims by Bush and his crew were not only wildly off target, he knew that they were when he made them, without any doubt. By the end of the carefully constructed first two chapters, the prosecutor, known to devote several hundred hours to a closing statement for a jury, has the reader prepared to accept his charges. He pauses before beginning his core case to let us know the cost of these lies. Over a hundred thousand died in a war predicated on lies which were deliberately fabricated by the president. These aren't just any deaths, we are told. We are dealing with the murder of young, impressionable, patriotic Americans who joined the service for a variety of honorable reasons. They all shared one bond, loyalty to their country and a willingness to die for it in war. While Bugliosi shows highly appropriate concern for the dead Iraqi civilians as a result of the civil chaos caused by the Bush invasion, he notes that he could find no domestic law allowing a prosecution for those losses. After the first three chapters we know the tragedy that requires a legal remedy and we are clear about the author's motivation to seek justice on behalf of the fallen. He is righteously angry that this crime has taken place and determined to provide the means for justice. Bugliosi is indifferent to a virtual media blackout as a result of the comatose state of the political and corporate elite, manifested through the calculated denial of their network news readers and the Bush administration stenographers at the New York Times and Washington Post. On October 1, 2002, Bush received a National Intelligence Estimate (NIE) representing all federal intelligence sources. Iraq's imminent danger to the Unites States was described in this sentence: There's no reference to poison dispensing unmanned aircraft, weapons sales to al Qaeda which would be turned against us, or other immediate dangers. View All 12 Articles in "Michael Collins Articles"
View All 6 Articles in "Vincent Bugliosi Interviews"